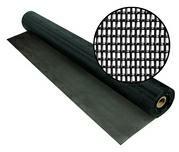 Pet Screen Black Roll contains ultra strong screening that resists tears and damage by dogs and cats yet still offers superb outward visibility. Ideal for areas where children or pets push against the screen. Available in black only. Great material. Strong but easy to work with. Have used this product on several projects and it works great. Had a defect in part of a roll of screen but Quality Screen did an excellent job of making it right. Good company to buy from. Excellent product. Have three dogs who would always destroy conventional screens. This one is holding up as promised. Advantages: Puncture resistant and very durable. Disadvantages: More effort to install due to thickness but worth it. It is better then I thought. very strong and yes it will keep small animals out from getting into our patio. The dog mesh I got is just GREAT! My little dog has jumped up but nothing tore or even moved. With the tools I got, it was easy to remove the old screen and put the new one in. Advantages: I know I saved a lot of money doing it myself. It was very gratifying. I have a cat (Katie) who LOVES to jump on the screen when she see a lizard. This is the first screen I have used that could withstand repeated abuse from her. An unexpected side benefit was how much sun it blocked out without hurting my view of the pond and conservation behind my home. Highly Recommended! NOTE! : THIS SCREEN IS THICKER then usual screen and I recommend using a spline that is .1" THINNER than your old spline. Well, I gotta tell you, that's about as quick as it gets. They delivered the pet screen this evening. Thanks again for such great and quick service.